If you or someone close to you has been hurt by the careless or reckless conduct of a person or business, you may be entitled to compensation for your injuries. The Law Firm of Valerie J. Crown can help you pursue justice after many different types of accidents, ranging from car crashes and slip and falls to product liability claims and dog bites. We also compassionately assist families who are bringing wrongful death actions after the tragic loss of a loved one, such as in the nursing home setting. Our attorneys can provide people in Rockland County and elsewhere in Greater New York with the careful attention that they deserve. We have over three decades of experience, and our small size allows us to pursue each claim with individualized focus. Valerie J. Crown is always available through her cell phone, and your call will go straight to her without an automated message or answering service. Rather than seeing the people whom we help as case numbers, we care deeply about each of them on a personal level. 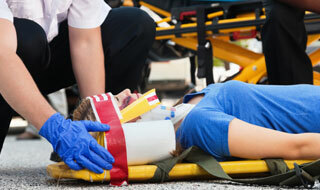 Most accidents result in personal injury claims based on a theory of negligence. The first requirement in a negligence case is showing that the defendant owed a duty of care to the plaintiff. To accomplish this, the injured person (or a deceased person’s family in a wrongful death case) must prove by a preponderance of the evidence that the defendant had some type of legal obligation to the victim. This can be done through statutes and ordinances, such as speed limit laws or the requirement to give a signal before turning. It may also be accomplished through expert testimony, which is usually essential in cases that involve professional negligence. An authority in the field may also be needed to testify in a product liability case about the exact nature of the defect in the device that caused the accident. The second step of a negligence case is showing a breach of the duty of care. This can mean showing that the defendant did something that he or she should not have done, like running a red light. It also can consist of proving that the defendant failed to do something that should have been done, such as neglecting to mop up spilled liquid on the floor of a supermarket. The victim is also required to identify a connection between the defendant’s breach of duty and the accident, which must not have been something that would have happened if the appropriate standard of care had been met. Finally, the injured person must show that he or she incurred quantifiable damages. Regardless of whether you have been hurt because of a falling object, a speeding driver, a vicious dog, or a flawed product, your accident likely has wreaked serious havoc on both your health and your finances. In addition to shouldering the burden of substantial hospital bills, victims may suffer from broken bones, lacerations, closed head injuries, sprains and strains, chronic pain, and mental issues such as depression and anxiety. While money does not undo the wrong that a defendant has done, it can help an injured person pay for medical expenses, replace lost wages, and fund repairs to property such as a vehicle. It is also the only way that a negligent person or business can compensate a victim for the physical pain and suffering that an accident has caused. The Law Firm of Valerie J. Crown has extensive experience representing accident victims. Our lawyers have guided individuals from Rockland County and the surrounding areas through medical malpractice and other personal injury claims. When we accept a case, we are making a commitment to tirelessly and aggressively pursue justice on your behalf. We understand that you may need help not only with the litigation of your case but also with navigating through an equally complicated medical system as you receive treatment for your injuries. Call us today at 845.708.5900 or complete our online form to schedule a free consultation. We represent accident victims throughout Greater New York, including in Westchester and Orange Counties. Since we understand that your accident has likely left you without the financial means to pay attorney fees upfront, we accept most cases on a contingency fee basis. This means that you do not owe us anything unless we recover a settlement or judgment in your favor. One of Valerie’s personal injury awards includes an $850,000 settlement during a Bronx County trial for a head injury arising from a car accident as well as other impressive verdicts throughout the greater New York area and Rockland County.